The night before Valentine's day I found this post behind a locked storefront on 7th Ave in Park Slope, Brooklyn, the source of many lowercase L's here. 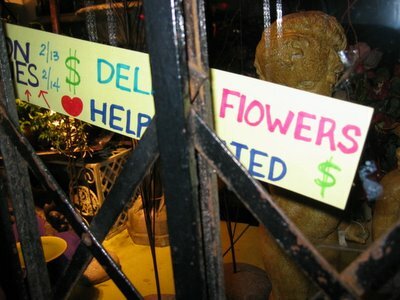 The sign advertises DELIVER FlOWERS HELP WANTED. The inconsistent use of lowercase and uppercase L's in the sign makes me wonder if they are advertising for help writing signs properly. Or perhaps the cry for help is from some guy trapped in the store, being held captive by the weirdo who wrote the sign. I'm finding an average of 1 lowercase L per week in my neighborhood alone. Surely this phenomenon is not restricted to just a few square blocks in Brooklyn. Readers, please keep your eyes peeled and your digital cameras handy. I hear you, and I promise that I am looking everywhere I can for the elusive lowercase L. I think the main problem is most of the writing I see around here is all lowercase, not many people write in all caps.